Brightech Ambience PRO Waterproof Outdoor Globe String Lights with G40 LED Bulbs - 26 Ft Commercial Grade Heavy Duty Lights - Cafe Bistro Gazebo Patio Lights w. Hanging Edison Bulbs- Blk by Brightech at Outlet Shopping Guru. MPN: AMBG40LED. Hurry! Limited time offer. Offer valid only while supplies last. Classy Weather Resistant LightingBrightech Ambience Pro LED Outdoor Lights feature WeatherTite technology-the wire is extra protected against nature. Brightech Ambience Pro LED Outdoor Lights feature WeatherTite technology-the wire is extra protected against nature. Wrapped in a strong rubber casing of premium quality construction, our strands hold up to the harshest elements. They are well insulated so you can leave them out all year, even during bitter cold winters. Rains will fall and winds will blow, yet these heavy-duty outdoor LED light sockets are strong enough to withstand the wear and tear of outdoor use every year. These durable energy efficient outdoor lights can transport you to the shores of the Mediterranean for a romantic dinner or illuminate Christmas tree lots under the wintry night air. They can also be used indoors to brighten playrooms or as creative light decorations around your home. The vintage design with retro exposed filaments provides a soft glow to accommodate al fresco dining after dark, while being gentle on the eyes and environment. Tether up to 50 strands together with nothing else needed to connect additional sets as they plug into one another, end to end. These LED light bulbs have a candelabra E17 socket base. To purchase replacement bulbs, enter B01JRLUZJI in the Amazon search box. The 26 foot length of our cord lets you arrange strands in a variety of patterns or clusters easily thanks to the convenient hanging loops along the light strands. Attach the loops simply with zip ties, cup hooks, or guide wire before enjoying a night under the stars. To keep multiple strands together across a long distance, use electrical tape to secure plug connections. Recommended for use in arbors, your porch, or other open air spaces for festive occasions, garden parties, weddings, winter holiday & Christmas events, indoor use, city rooftops, or simply for energy saving ambience year-round. Go Green with LED Electric String Lights by Brightech! TRANSFORM YOUR OUTDOOR SPACE WITH GLOBE STRING LIGHTS: Use the Brightech energy efficient outdoor LED hanging lights to transform your back yard into an Italian paradise or arrange the bistro lights over a pergola to evoke the feeling of being in the wine country for an evening. The opportunities are endless as you can uses these gorgeous, heavy duty string lights to transform your patio, gazebo, porch, deck, garden, or balcony into your own dreamland year round. STRONGEST, WEATHERPROOF GLOBE LIGHTS ON THE MARKET: These lights are designed to withstand the wear and tear of year round outdoor use. They are UL listed, weatherproof, waterproof, and built with Brightech's durable WeatherTite Technology so that they can withstand extreme temperatures, rain, wind, and damp climates. The cord is made of rubber, flexible, and thicker than a traditional cord so that you can confidently leave these ultra-durable commercial string lights on display all year long. PERFECT OUTDOOR STRING LIGHTS FOR ENTERTAINING: Our globe lights are the perfect touch to add style and ambiance to any of your indoor or outdoor celebrations. 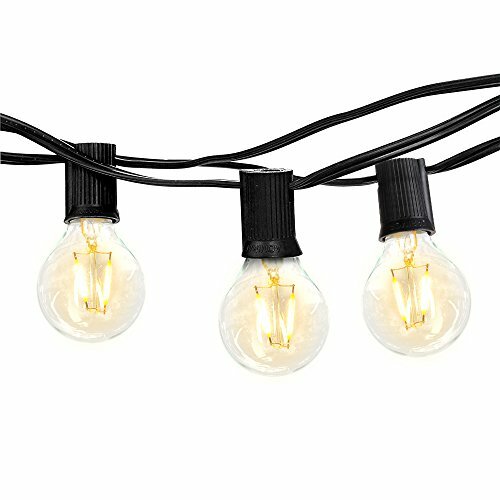 Our heavy duty LED string lights will create the perfect atmosphere for a birthday party, family reunion, evening cocktail party, or wedding reception. These lights never get hot even after hours of burning so that you can also use them to decorate indoors as well. Amaze your guests with the beauty and sparkle of these globe lights. ENERGY EFFICIENT GARDEN LED LIGHTING: These lights save energy with 12, 1-Watt LED glass bulbs so that you can save money on your electric bill and you can skip having to buy any replacement bulbs. Our LED lights are long lasting and will endure for more than 20 years without burning or overheating. These lights will outshine bulbs that depend on short lived, energy sucking standard halogen or incandescent bulbs. Invest once in these gorgeous energy efficient lights and save money long term.